Rangers have signed Lionel Letizi after the 33-year-old goalkeeper was allowed to leave Paris St Germain. He has joined the Glasgow club on a two-year contract and becomes new manager Paul Le Guen's sixth signing. Letizi had a year of his contract still to run with PSG but was allowed to leave Paris following the signing of Mickael Landreau from Nantes. Le Guen said: "He is a very experienced goalkeeper who is looking for a new challenge and will be a great asset." The new manager had stepped up his search for a goalkeeper after Ronald Waterreus failed to agree terms on a new one-year deal, ending his 18-month spell in Glasgow. Former first choice Stefan Klos has been ruled out for up to four months after damaging his shoulder in a cycling accident. That left Allan McGregor, loaned to Dunfermline Athletic last season, as Rangers' only fit, experienced goalkeeper for the coming season. Letizi, who had been with PSG for six years, was reportedly attracting strong interest from Nantes and new Ligue 1 outfit Valenciennes. But, after a successful medical in Glasgow on Friday, he told the Rangers website: "Rangers is a huge club with a fantastic support and I am looking forward to the new challenge under Paul Le Guen." Le Guen had turned down the opportunity to sign France goalkeeper Fabian Barthez because of his wage demands. Barthez, the 34-year-old former Manchester United player who is a free agent after quitting Marseille at the end of last season, was offered to the new Ibrox boss. The Frenchman's agent, Jean-Marie Cantona, brother of Eric, said: "I know Paul Le Guen very well from his time in France and had a friendly discussion about the possibility of Fabien going to Rangers. "I knew Paul wanted to change his goalkeeping position at Rangers, but he didn't want to take on Fabien. He has other options and I respect him for that." 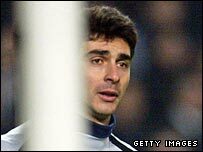 Letizi, capped four times by France, faced Rangers in December 2001, when the Ibrox club eliminated PSG from the Uefa Cup after a penalty shoot-out. He is expected to be joined at Ibrox next week by midfielder Jeremy Clement, who is poised to be transferred from Olympique Lyonnais.